While weddings used to be a seasonal event, now they are joyfully celebrated year round. Spring bridal traditions often seem out of place at a golden autumn vineyard wedding. But have no fear – there are two elegant French wedding traditions, one classic and one more contemporary, that can easily bridge the gap from June to October. Nothing but nothing says “wedding” like a towering wedding cake, embossed with frills and flowers all crafted in sweet sugar frosting. When made by professionals, the effect is light and bright – perfect for a spring or summer wedding. But come a fall or winter wedding, the traditional tiered wedding cake can seem slightly out of place – far too delicate a taste or image to serve when cold winds blow. For these seasons of falling leaves or drifting snow, the traditional French wedding cake, the croquembouche, is a rediscovered perfect choice. French chefs create this stunning cake by stacking caramelized cream puffs into a pyramid that is as visually beautiful as it is tasty. Made popular by the famed French Chef Antonin Careme (1783-1833), these towering wedding cakes with their stunning appearance were an inpressive treat for the waiting guests. Then as France’s empire and culinary influence increased, elaborate decorations, such as flowers crafted from royal icing and spun sugar drapes, were added. Today’s creative French chefs often offer their clients croquembouche crafted from chocolate truffles or macaroons in addition to the classic rounded cream puffs. 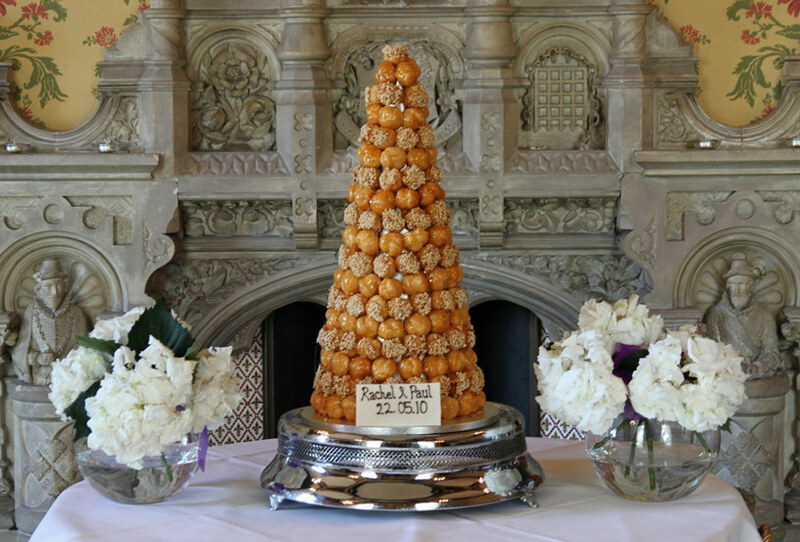 As a result, croquembouche are also suitable for birthdays, anniversaries and other special celebrations throughout the year. A newer romantic French tradition centers around "Love Locks." After finding one’s true Love, the fortunate couple writes their names on a lock, attached it firmly to the famed Pont de l’Archeveche bridge and then toss the lock key into the river with the promise to Love each other forever. Now, though the imagery is touching, you can easily imagine that the administrative staff of Paris is less than charmed at having to remove hundreds and hundreds of love locks from the city’s bridge railings (any more than a hotel would be). So why not convert the concept into a champagne cocktail (what could be more French or romantic) called perhaps the “Love Lock” that the wedding couple can share together at their reception, with possibly an actual key given them by the well-wishing hotel staff to toss or treasure after their wedding dinner reception? Posted on July 28, 2011 by Ana Kinkaid and filed under Alcohol, Champagne, Chefs, Chocolate, Cocktails, Cooking, Culinary History, Dessert, Elegance, Films, French Cuisine, Movies, Style, Trends, Wedding and tagged Antoine Careme Chocolate Truffles Croquembouche Love Locks Macaroons Paris Wedding Cakes.